Large or small, houses in the Twin Cities metro area are home to countless families, who spend much of their time within those walls. Making a home inviting, comfortable, and a uniquely wonderful place to live is the goal of every homeowner. Keeping rental homes attractive and comfortable for tenants is the goal of landlords and property managers. Making improvements or fixing problems requires skills and experience that most homeowners and property owners simply don’t have. As you look around your home, make a note of things you’d like to do to make it more comfortable and attractive, and jot down areas in your home that could use some attention. Then give our Twin Cities handyman company a call and let us help you make those home improvements and repairs, efficiently, affordably, and expertly. Living & Great Rooms – From painting and repairing every part of these rooms to creating built-in amenities, like entertainment centers and seating, along with installation of flooring and window treatments, HandyQuick’s talented professional craftsmen and trade partners let you treat your great room or family room as a canvas for your creativity. Family Rooms – However your family uses this room, you can make it unique with the skills of the building trade specialists from our Twin Cities handyman company. Refresh, renew, fix up, and create a family room that matches your family’s interests and preferences. 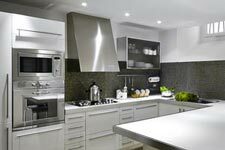 Kitchens – From keeping your drains running free to a complete remodeling job for your kitchen, our experts can help you make your kitchen both exciting and functional. New cabinets and countertops, or a food preparation island are just some of the things we can do. Dining Rooms – From entertaining guests to family dining, HandyQuick is your partner in making your dining room a welcoming place. Call us to install new lighting fixtures, flooring, wall treatments, and more. Bedrooms – We spend almost a third of our lives in our bedrooms, so they need to be welcoming, restful spaces. The experienced members of our team can help you with closet systems, painting, window treatments, flooring, or even a complete remodeling job. Baths – Let HandyQuick’s network of plumbers, carpenters and electricians take care of plumbing problems, install new cabinets, flooring, and fixtures, or do a complete remodeling of any bathroom in your home. We can even create a brand new bath upstairs or in your basement. Just give us a call. Basements – Expand your living space by finishing your basement or remodeling it to suit your needs. Add an egress window for safety, and then add bedrooms, a bath, entertainment areas, or a home office. Or just add storage shelving and a new sump pump. Let us keep your furnace, hot water heater, and other appliances running smoothly. With our services, the cost is always affordable, and the benefits are huge. Utility & Entry Rooms – Laundry rooms, entry rooms, storage areas, and other rooms in your house are often neglected. Our complete handyman services company offers a full range of services to repair or install appliances, create storage facilities to help you get organized, and to make these neglected spaces even more useful. Decks – A deck can add significant space and a aura of openness to your home. A deck is great for entertaining, or for simply relaxing and enjoying a nice day. Our services can build a custom deck, or simply refurbish your existing deck. One call to HandyQuick gives you access to a complete network of services for your home. Our carefully selected handymen and building trade professionals have the expertise, experience and creativity to perform just about any job you can imagine. Because they work efficiently, the cost of your project will be lower than you expect, and the results will be outstanding. From the smallest repair to the most complex remodeling job, you can rely on the pros from our one-stop home repair, remodeling, and maintenance company.